Star-Glo Industries was incorporated in 1950 and now occupies plant and office facilities of approximately 100,000 sq. ft. at one location. The company is privately owned and is a non-union shop. Star-Glo has steadily progressed to a leadership position in Swiss screw machining, rubber, rubber-to-metal components and assemblies. Complete vertical integration remains our cornerstone in the industry. The company specializes in custom manufactured parts and assemblies selling to both commercial and government markets including Military, Aerospace, Electronics, Inflation Components, Transportation, Welding, Packaging, and Business Machines. Star Glo State-of-the-Art CNC Swiss machining department has built its reputation by manufacturing the highest quality custom parts and through dedicated service and programs designed to meet your individual needs. Star Glo can provide seamless "one stop shopping" for Compression, Transfer & Injection Molding that eliminates multiple suppliers that often costs customers wasted time and added cost. Our machine shop services and capabilities, include design, engineering, and assembly. Our quality assurance staff is combined with our ability to effectively outsource all raw materials to ensure on time deliveries and the peace of mind to know that all parts and assemblies are made to the highest standards. Customers Include: General Dynamics, Lockheed Martin, B/E Aerospace, BF Goodrich, Raytheon, United Technologies, Heico Ind., WABCO, Cubic Systems, McDonnell Douglas, Ametek SCP, Meggitt Systems, Gichner Mobile Systems, Sig Sauer, Taurus, Colt, Fairchild Industrial Products, FN Mfg, Scientific Games, The Dept. of Defense, USPS and many others. Some of the products currently being manufactured are for use on the military Hummer, M16, M40 and M60 Weapons, Submarine Hatch and Muzzle Ports, First Class Bundle Sorting Equipment, and many others. Complete capabilities guarantee close quality control, realistic shipping dates and very competitive prices. Value-added and sub-assembly services are also available with adequate engineering support and dedicated floor space. Large modern machine and mold making shops produce every mold, fixture, shaft and insert in-house. Our lab develops and maintains a broad range of polymer formulations. We routinely compression, transfer and injection mold and finish to the most precise tolerances. We mold in all thermoset and thermoplastic materials. Our customer relationships are built and maintained on SGI’s commitment to quality at all stages of service and production. Star-Glo Industries is ISO 9001:2015 certified. In addition - to assure quality thru all phases of manufacturing we have developed and maintain processes that meet or exceed the requirements of MIL-STD-45208. SPC data and JIT/IDPO services are available on all products. Click here to view our ISO 9001:2015 certificate. 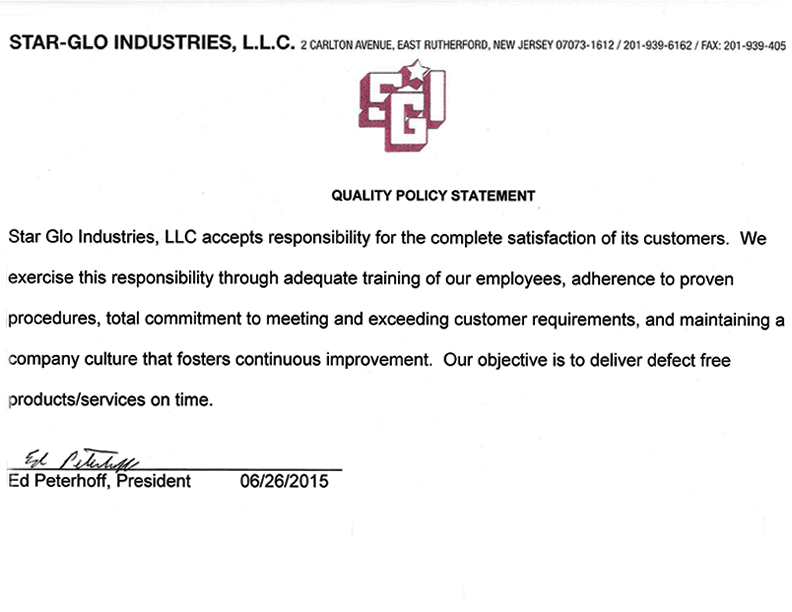 Click here to view our Quality Policy. Copyright © Star-Glo Industries, LLC. All rights reserved. Site Designed and hosted by Design-2-Part Web Design.